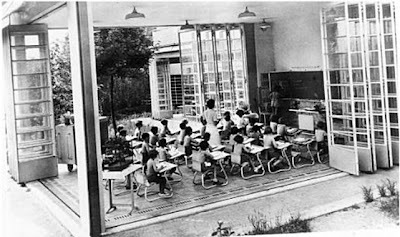 The open air schools were established when tuberculosis was largely present, which affected people living in unhygienic conditions or poor housing. Doctors advocated patient hygiene and improvement in living conditions with fresh air. David Sarson in 1907 advocated designing new 'hygenic architecture' - to let in great masses of air and light. 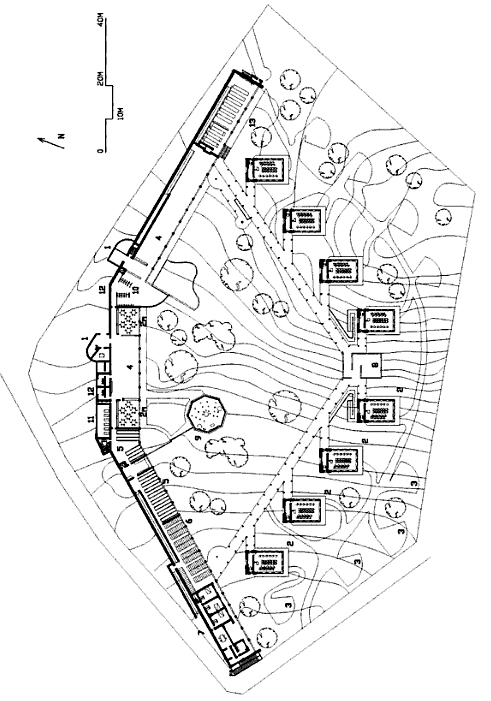 This open-air concept affected the architecture of schools. The open-air school was born in Berlin, Germany in the 1890s. The first 'cure station' was for men and was built in 1900 in a pine forest near a railway station. Its immediate success led to many more being established in Germany. Hermann Neufert an education councillor and Bernhard Bendix a school physician were both convinced that the brisk air of the nearby Grunewald forests would be good for weak children and thought that the open-air 'cure-station' would be a good model to follow. 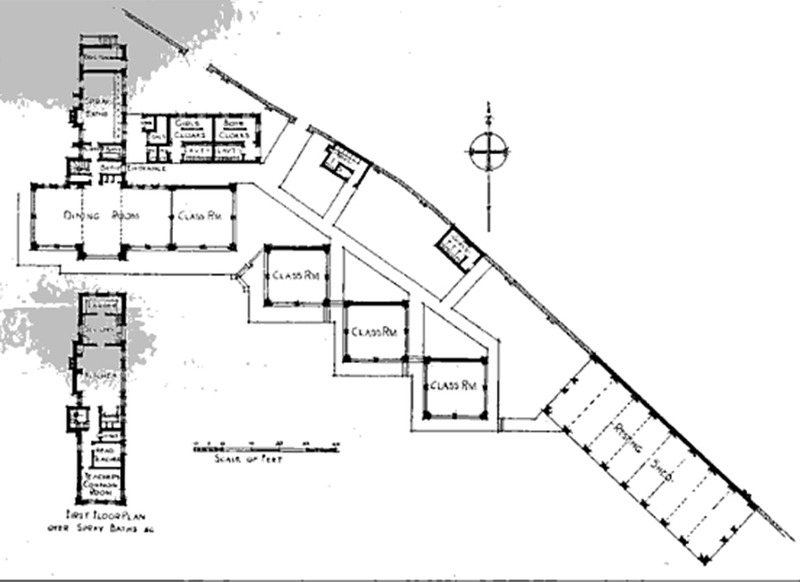 Waldschule, Charlottenburg, Germany; Walter Spickendorff, architect, 1904, site plan. 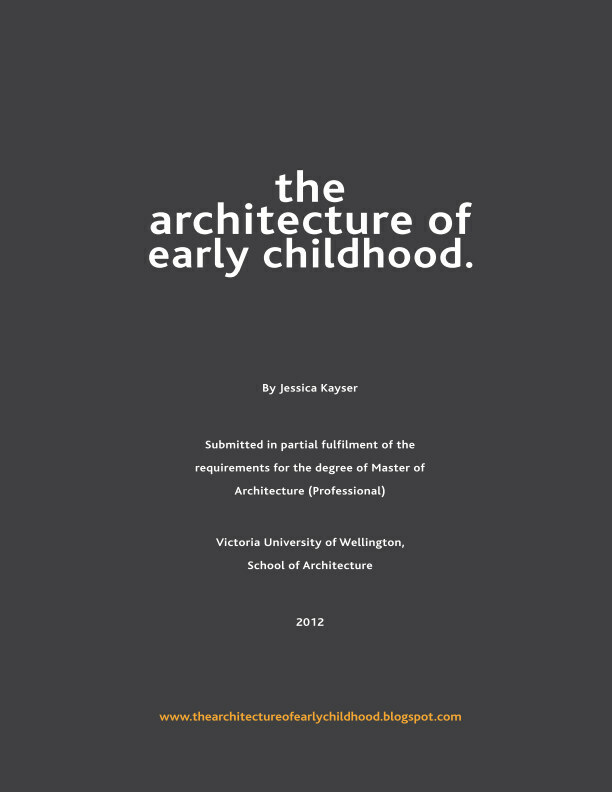 Photograph obtained from 'Designing Modern Childhoods', p.109. Waldschule, Charlottenburg, Germany. Classroom and dining sheds. Photograph obtained from 'Designing Modern Childhoods', p.110. 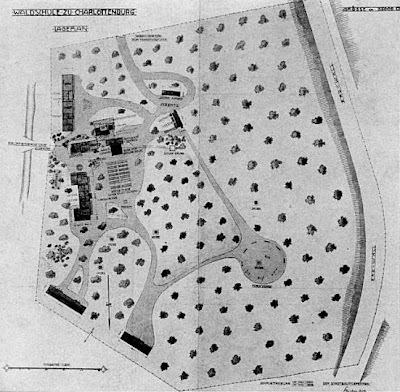 The Waldschule (forest school) opened in 1904 and was designed by Walter Spickendorff. His aim was to maintain visibility for surveillance, to retain the irregular form of the existing landscape and the tall pines and to provide maximum exposure to the sun. 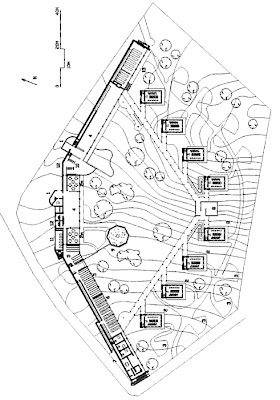 He created a slight hollow in the middle of the plot, which constituted the heart of the school, a space with plants and shelter, surrounded by activity areas, overlooked by the rest galleries, classrooms, kitchen and toilets. On the children's submission a doctor examined them. At the end of their stay, most had improved markedly. The school grew quickly, requiring an extra classroom, and an 'air and sun bathing area' was installed - a mound of earth and a 2-metre high fence surrounding, where the children came to lie in the sand and soak up the sun. There were also gardens where children were offered plots to cultivate. It was an innovative educational experiment. Lange, the school principal stressed the modernity of the approach with its emphasis on direct observation, rather than "indirect" studies of stuffed animals and dried plants. Teachers were asked to adapt their methods and "tone" of teaching, replacing irony and sarcasm with encouragement. 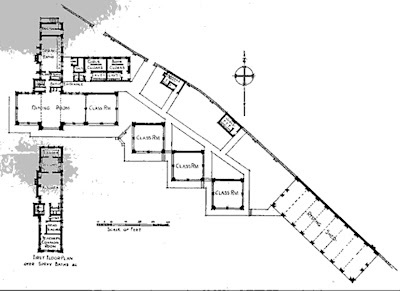 The design of the school, whilst simple, was a foretaste of things to come. With its location out of the city centre, the size and nature of plot (more space), and no boundaries (except for the plot itself). 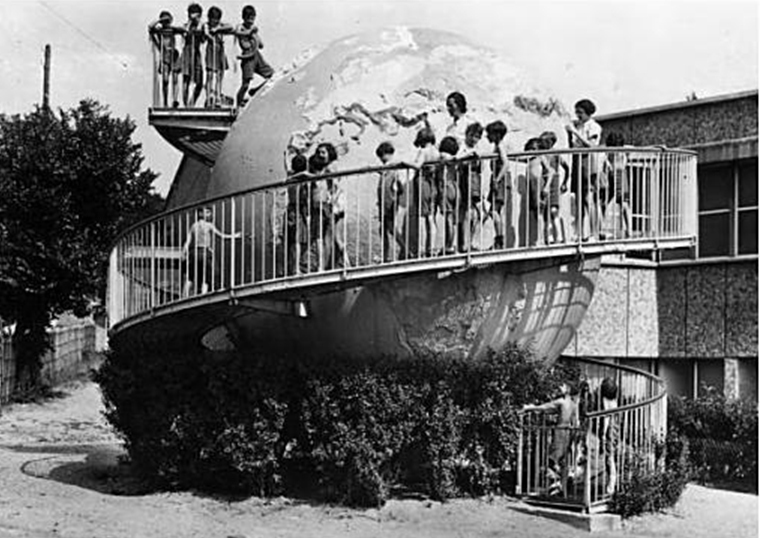 The experiment was encouraged by the Prussian government and was publicised at international conferences, as a result many open-air schools were established all over Europe. The first open-air schools were modest constructions, temporary cabins set up on an available plot, and simple in design. Yet, soon began to attract attention and investment in designing permanent open-air schools. The challenge was to build a protective envelope whilst making it as immaterial as possible. 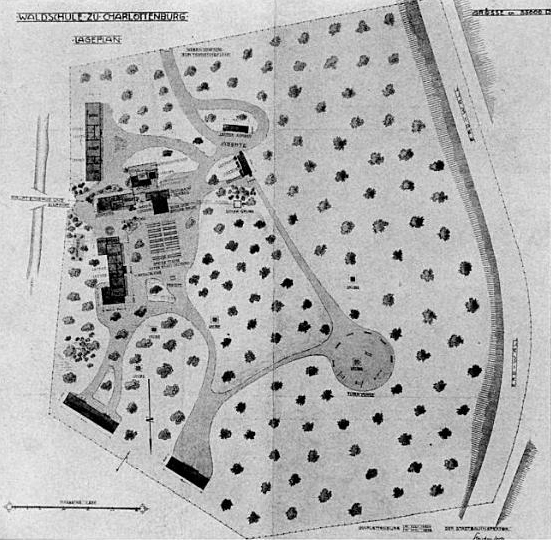 Uffculme Open-Air School, Birmingham, Great Britain, site plan; Barry Peacock, architect, 1911. Drawing obtained from 'Designing Modern Childhoods', p.114. 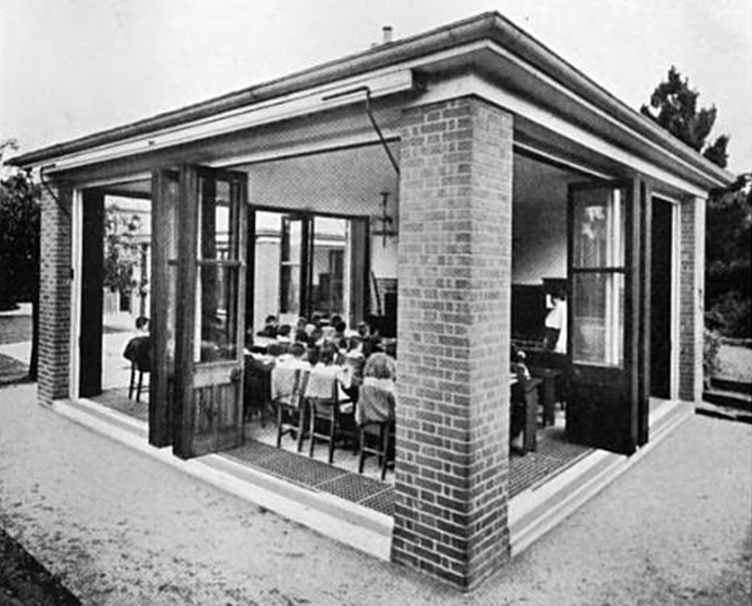 Uffculme Open-Air School, Birmingham, Great Britain, classroom. Photograph obtained from 'Designing Modern Childhoods', p.114. One of the first permanent designs was in Birmingham, England. Designed by F. Barry Peacock and Bewlay. It was instigated by Barrow and Geraldine Cadbury, the famous chocolate family because their son had contracted tuberculosis. In 1910, they offered a site and to pay for the construction and the Birmingham Education Committee funded the new open-air school. The school (like Waldschule) was sited in the suburbs and was made up of classrooms, service rooms, and an open gallery, however, it was not in a forest and the buildings were not cabins. Three square, wood and brick villas, which opened on three sides by means of folding glass doors and topped by a pavilion roof. Only on the northern side was there a solid brick wall, where the blackboard was hung. "Geraldine Cadbury is credited with the ingenious idea of the central heating system whereby underfloor hot water pipes ran around the sides of the classroom beneath a grille; the theory being that the cold air entering the room would be tempered by the rising heat." The building represented an inventive and tailored response in light of the limited financial resources. 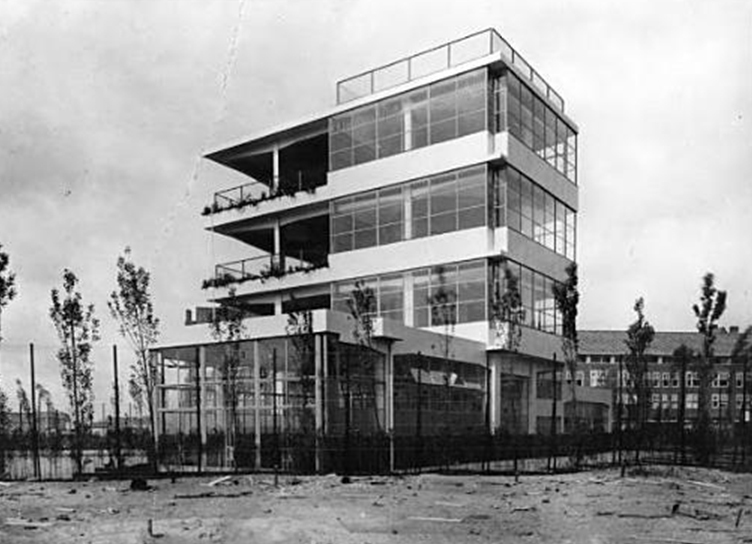 The most radical in terms of density and openness was the open-air school in Amsterdam by the architect Jan Duiker. Open-Air School for Healthy Children, Cliostraat, Amsterdam, Holland. Jan Duiker, architect, 1930. Photograph obtained from 'Designing Modern Childhoods', p.118. Designed for children in good health, it was intended to extend the educational benefits to all school children and was to be built in the city on a 2000 square meter plot in the middle of a housing block. Duiker responded to the challenge by designing the classrooms in pairs, with a terrace between for open-air activities. They were superimposed on one another to create three floors, with the blackboard in a corner recess. The concrete construction eradicated the need for bulky weight-bearing corner columns, all four sides had long continuous strips of windows, and heating was filtered through the ceiling.